Kit covers your most essential accessories your Toshiba Chromebook 2 2015 Edition needs. 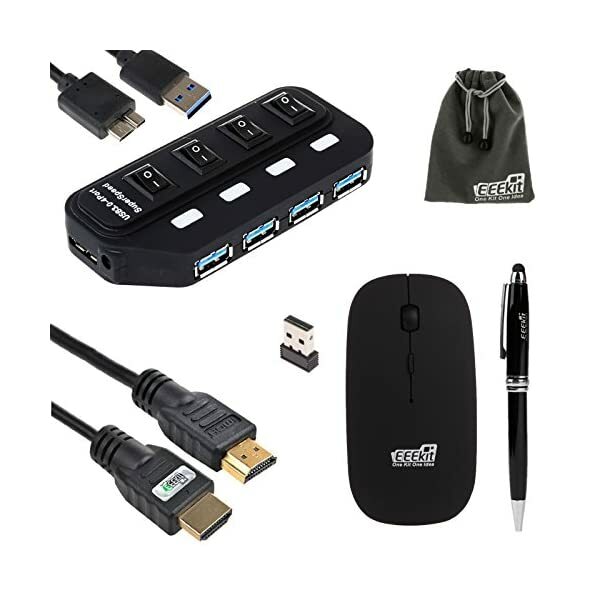 The special design of this USB Hub is that it has four switches correspond with each USB Hub respectively. Bluetooth wireless optical mouse powered by two AAA batteries ( not included ). Adjustable DPI/CPI switched between 800, 1000, 1200. Includes a travel pouch for easy storage. 【JOHAKU FOUR IN ONE MICRO SD CARD READER】 - This Card Reader is great compatibility for all your devices. It has four interfaces: lighting connector for iOS devices; Micro USB connector for Android devices (with OTG); USB connecto for computers/Macs; Type-C connector is for Type-C devices. 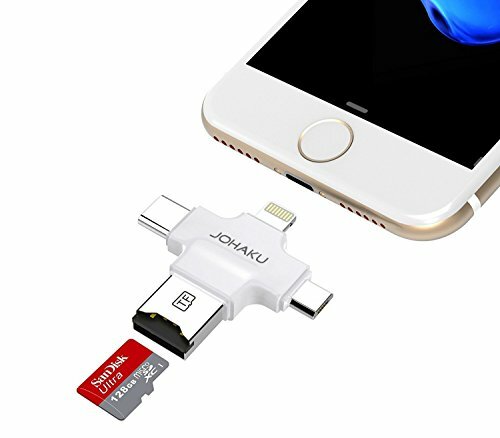 【SPECIAL FUNTIONS OF JOHAKU CARD READER】 - Transfer your important Photos, Music, Videos, and backup contact list; Secured private-Files encryption only support owner's device to read the data; Share the files on your Micro SD Card or TF Card using third-party apps shuch as Facebooks, Instagram,Snagchat, Twitter and more, like the photo or video in your gopro TF card, you can share it in few seconds. MobileVision Compatible Adapter for Apple Airpods Only: Clip this adapter onto any side of your MobileVision Bamboo Charging Station and keep all your devices charging in one convenient location. Bamboo Stands sold separately. Pair adapter with: Original Bamboo Stand ASIN: B00PV7ADHW, Bamboo Stand w/ Extension ASIN: B011JPZVOE, Slim Bamboo Stand: B018WJIUG6, 10-Port Stand ASIN: B018WRL9R0, Bamboo Stand w/ Speaker Cutout ASIN: B01BXKS782, and NEW Bamboo Personal Stand ASIN: B01IGAT7YA) Adapter works with combo SKUs as well. 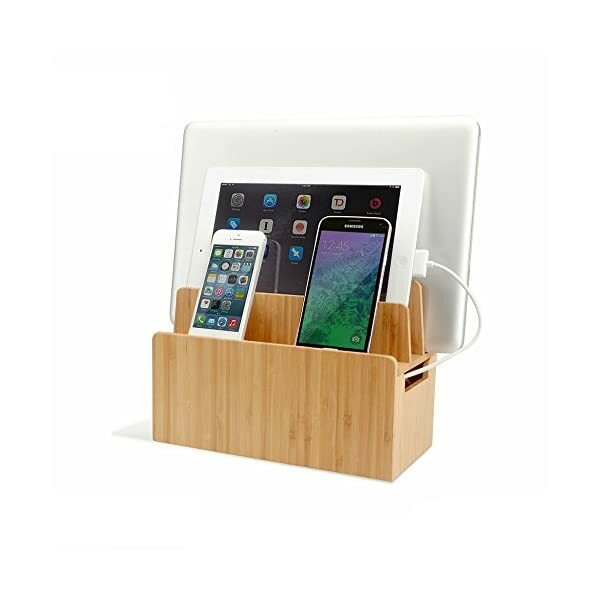 The natural and beautiful eco-friendly bamboo material blends seamlessly with the high-quality bamboo expected of the MobileVision charging station organizers. 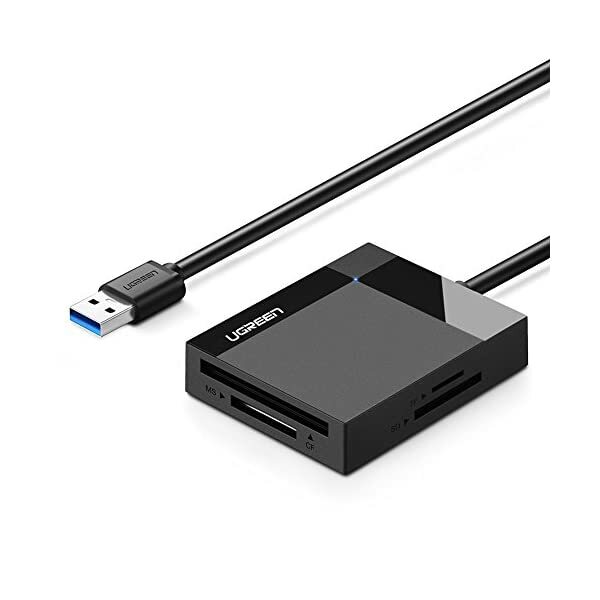 One Reader for Multi Cards: Ugreen USB Card Reader is designed with 4 card slots: SD, Micro SD, CF, MS slots and USB 3.0 connector, which allow you to read and transfer data the most popular flash media on the computer, laptop, tablet through USB 3.0 interface, including SDXC/SDHC/SD/Extreme I III SD/Ultra II SD/MMC/RS-MMC or Micro SD/TF/Micro SDXC/Micro SDHC/UHS-I or CF I 3.0/4.0 /Extreme I III CF/Ultra II CF/HS CF/XS-XS CF/CF Elite Pro/ CF Pro/CF Pro II or MS/MS PRO/MS PRO-HG/MS XC DUO. Super Speed&High Capacity: Ugreen USB Memory Card Reader support SD/Micro SD card up to 512G and allows super fast data transfer up to 5Gbps - 10X faster than USB 2.0 (480 Mbps), which allows you to transfer HD movies or files in just seconds, when your host is equipped with USB 3.0 port. Also backward compatible with USB 2.0, 1.1 and 1.0 (speed limited by USB bus). Compact Design&Premium Quality: So useful but so compact. Easy to grab and go. Reinforced cable, Tin-plated pure copper core and multi-shielded inside, sturdy exterior and heat-resistant connectors ensure high data transmission efficiency and ultimate durability. 1.5ft short cable tail would reduce stress on the USB port on your computer and won't affect the use of adjacent ports. LED indicator will be ON when the card reader is connected to computer. 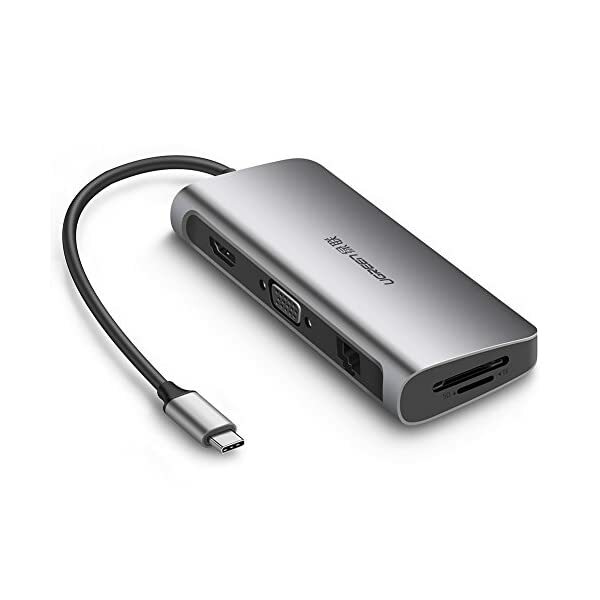 MULTIPORT CONNECTION: UGREEN USB-C hub easily expands your USB C (Thunderbolt 3 compatible) enabled Mac with HDMI, VGA, 3xUSB 3.0 port, SD TF card slot, 1000 Mbps RJ45 Ethernet port and 1 Type-C Power Delivery 3.0 charging port. HDMI OR VGA OUTPUT: Allow you to mirror or extend Macbook to HDMI-enabled TV in Max 4K UHD 3840×2160 at 30Hz or VGA display in up to 1080P at 60Hz Full HD. NOTE: HDMI and VGA outputs can NOT be used simultaneously. 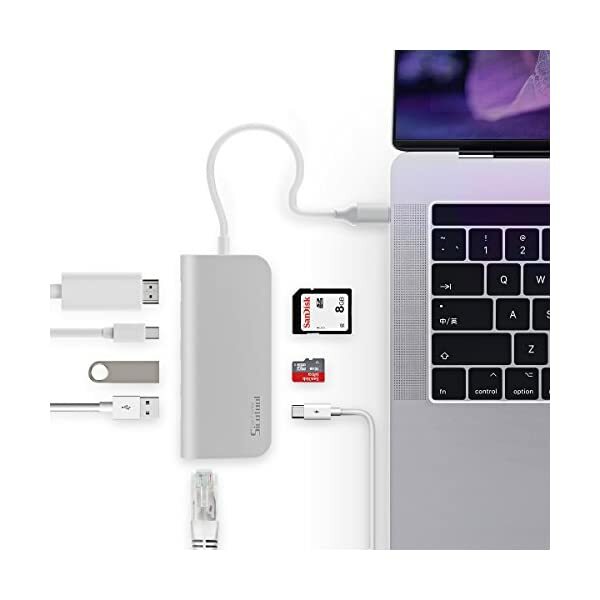 EFFORTLESS DATA TRANSFER: 3-Port USB 3.0 hub let you continue to use existing USB 3.0 peripherals like flash drive, hard drive, keyboard, mouse, printer, thumb drive or USB sticks with your new Mac. Built in SD and TF slots easily access files from universal SD and Micro SD memory card; Support 2 cards reading simultaneously. 1000Mbps Ethernet port definitely ensures more stable and faster wired network connection compared to WiFi. COMPACT CHARGING DOCK ALL IN ONE: AC adapter built in USB station plus 2 standard AC outlets, eliminate eyesore of outer power brick. 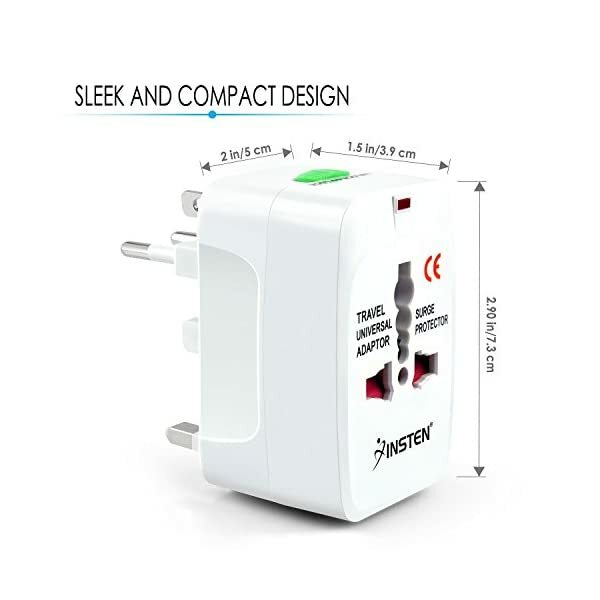 4x2.4A + 1 QC2.0 USB ports boost fast charging. Smart chipset prevent overcharging and overheating. LIFESAVER FOR CHARGING CRISIS: Charge your tablets and phones on the Charging Station, no more searching for outlets, lighting cables and plugs everywhere. Perfect for home, dorm room, office, community and more places. 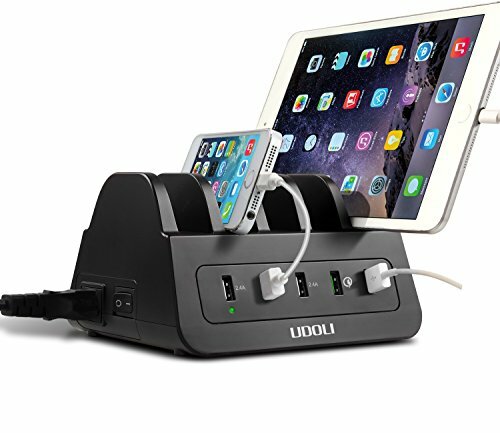 UNIVERSAL CHARGING STATION ONE FOR ALL: Compatible with smartphones, tablets, bluetooth headphones, power banks, e-readers, portable speakers, music players, digital cameras and any device that charges with an USB cord.